Burpless cucumbers are known for being easy to grow and easy on the digestive system, but you must know when they are ripe in order to maximize your return on the work invested. A cucumber removed from the vine too early may be too firm and lacking in flavor. Harvesting too late will leave you with cucumbers that are woody and dry. 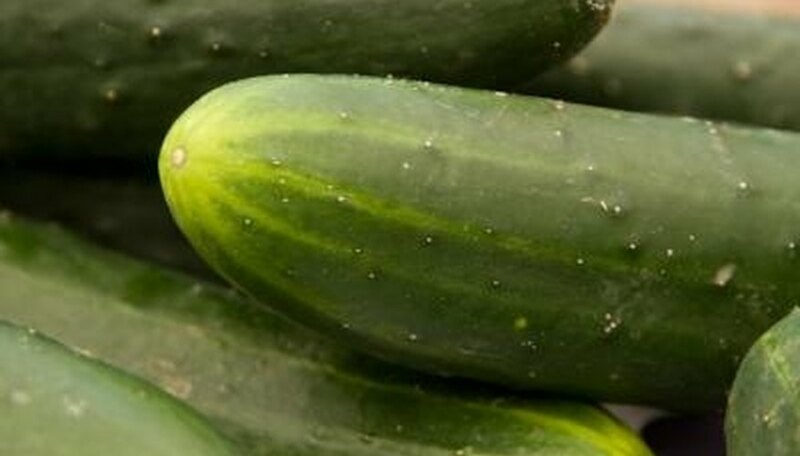 Knowing when you planted your cucumbers and how they should look when ripe may help you determine when to harvest them. Examine the seed packet for information regarding how long your particular burpless cucumbers should take to ripen and their expected size. Burpless cucumbers typically take about 50 to 70 days from planting to turn ripe. Size at picking time may range from 3 to 8 inches, depending on the intended use. Note on a calendar or in a notebook the date on which you plant the seeds. Begin inspecting the cucumbers for signs of ripeness six to seven weeks after planting. Inspect the cucumber's skin. A ripe cucumber usually has skin that is medium to dark green in color. Yellow skin on a cucumber indicates that it is past its prime. Feel the cucumber. Ripe cucumbers are firm. Cucumbers that are over-ripe are typically puffy, have wrinkled tips and sunken areas. Start planting corn, peppers, eggplant, squash, beans, tomatoes and pumpkins in June. Cucumbers can also be planted in June at the latest. Find an area to plant the lemon cucumber seeds with full sun and well-drained soil after the danger of frost passes in the spring. Build hills with a 12- to 16-inch diameter flat top and space multiple hills 30 to 36 inches apart. Mix 1 to 2 inches of organic compost into the soil of the hills to increase fertility for the plants. Plant the lemon cucumber seeds 1/2 to 1 inch deep on the hills, spacing them 6 to 8 inches apart. There should be three to four plants on each hill. Tamp the soil down firmly over the seeds to improve contact. Water the seeds deeply after planting. Keep the soil moist--but not soaked--and the seeds should germinate in seven to 14 days. Spread mulch between the plants when they sprout out of the ground. This will keep the moisture content of the soil even and keep down any weeds that may pop up. Without weeds, the lemon cucumber will not have to compete for nutrients. Fill a planter with high-quality peat three to four weeks before the average date of the year's last frost. If you plant on growing more than one cucumber plant, use one planter for each plant you intend to grow. Water the peat so it's thoroughly moist before you add the seeds. Plant two or three evenly spaced seeds 1/2 inch deep in the peat per planter. It's best to plant a couple extra seeds as some may not germinate. Put the planters in a sunny window. If the outside temperature is above freezing, you can put the planters outside in the sun during the day, but be sure to bring them back inside at night. Keep the peat moist at all times. The seeds should germinate within seven to 14 days. Harvest cucumbers early in the morning before the heat of the day has warmed them. Moisture content is highest in the morning when the flesh is crisp. Wash cucumbers in cold water to remove soil or garden residue. Dry with a soft cloth. Store in an area with temperatures between 45 and 55 degrees. Maintain relative humidity of 85 to 95 percent. Refrigerate cucumbers in your home refrigerator for up to seven days to maintain freshness and flavor. Although the refrigerator is typically colder and less humid that optimal conditions, it is often the best choice for home gardeners. Prepare and serve cucumbers immediately after removing from the refrigerator. Eggplant makes a good garden companion to both tomatoes and cucumbers. Choose an Asian variety or one with smaller fruit as the larger eggplant might be too heavy to grow upside down. From hot peppers to bell peppers, pepper plants come in many varieties. Pepper plants are closely to tomato plants, so it is not surprising that they also grow well upside down. Any variety of pepper can be grown upside down, from hot to mild and small to large. Any variety of bean will grow well upside down, from pole beans to bush beans. Since peas grow strung up like pole beans, they too grow well hanging upside down. From sweet peas to snap peas, any variety of pea will grow well in your upside-down garden. Pydrin is one of the best insecticides for cucumbers. It is the most effective against the most common cucumber pests, including cucumber beetles and squash bugs, according to the North Carolina State University. Rinse your cucumber under a faucet with cold water and set it on a cutting board. Slice the cucumber in to 2-inch circles with a sharp knife. Make sure adults perform this step. Scoop the middle of the cucumber out of each slice with a spoon. You will get more than just the seeds, but that is OK for now. Place the seeds in a bowl. Set the seeds in a colander and and place it under a stream of cold water. You will now be able to remove any pieces of cucumber and just keep the seeds. Set the seeds on a baking sheet. Sprinkle them with salt and wait for them to dry out before you eat them. You can dry them out quicker by setting them in the oven for 20 minutes at 275 degrees F.
Store any dried cucumber seeds you did not eat in a plastic baggy. Fill individual starter peat pots with starter potting soil. Cucumber seedlings develop large root systems so individual peat pots offer room for the plants' root systems and are easily transplanted into the garden. Plant three seeds per peat pot container to ensure the success of at least one of the seeds germinating. If all the seeds germinate then thin the plants to one per pot. Plant the seeds at a depth of no more than 1/2 inch in the soil. Place the peat pots in a window that offers full sunlight. Water the cucumber seeds using lukewarm water. Keep the soil moist to the touch but not waterlogged. Maintain a room temperature of 65 to 72 degrees Fahrenheit. There should never be a drastic temperature reduction during the night. Place the mulch around the base of the cucumber plants to help conserve soil moisture. Apply the mulch in a 2-inch-thick layer. Keep a rain gauge in a spot nearby the garden to enable you to monitor how much rain falls each week. If less than one inch of rain falls in a one-week period, provide supplemental water for the cucumber plants. Check the soil around the cucumber plants. Whenever the top inch of soil dries, water the cucumber plants until the surface soil is visibly saturated. Stop watering before puddles form. Allow two or more cucumbers on the healthiest plant tp mature fully on the vine. Pick once the skin begins to yellow. Slice open the cucumber lengthwise. Scoop out the seeds and the gel-like pulp that surrounds them and place into a large glass or jar. Add enough water to the glass to cover the seeds and pulp. Set the jar aside for one week, stirring once a day. Scoop the pulp and any floating seeds, which are not viable, from the surface of the jar with a spoon or carefully pour them off. Remove the viable seeds from the bottom of the jar. Spread the cucumber seeds in a single layer on paper towels. Let dry for one to two weeks. Place dried seeds in an envelope and store in a cool, dry place until spring planting. Alternately, place in a sealed jar and store in the refrigerator. The cucumber beetle is just one of several varieties of leaf eaters of the insect genus Diabrotica. Most common are the spotted and striped beetles, identified by the yellow stripes and black spots on the beetle bodies. The spotted cucumber beetle resembles in shape the ladybug but, unlike the ladybug, is not beneficial to the garden.The larvae are laid in eggs on the underside of the leaves of the affected plants. After hatching, they bore underground and attack the roots of the plant. Pyrethrum containing insecticides are the most used way of controlling the cucumber insect beetles. To prevent future re-infestations, the plants and debris should be removed from the area. The ground around remaining plants should be free of litter and cultivated regularly to remove hiding places for the beetle and the larvae. Cucumbers, squashes, pumpkins and melons. Adult cucumber beetles attack the leaves and stems of young plants and later attack the buds and fruits of the mature plants. As larvae, the cucumber beetles attack the roots and stems beneath the soil causing the plant to die. Cucumber beetle larvae are often called corn rootworms and can decimate a young corn crop. Soldier beetles, parasitic nematodes, Braconid wasps and Tachnid flies will prey on the adult cucumber beetle. The eggs fall prey to lacewings and ladybugs. A mix of 1 cup wood ash, 1 cup hydrated lime and 2 gallons of water can be used as a spray for the cucumber beetle. Spray both sides of the plant leaves thoroughly. Mulch heavily around plants that cucumber beetles favor. Adult beetles have difficulty moving from one plant to another over mulch. Plant radishes, nasturtiums and odiferous marigolds as a border around cucumber beds or circling squash, melon and pumpkin hills. * Planting castor beans among the plants also appears to repel the cucumber beetle. Well-placed bat houses can help in the eradication of many unwanted insect pests. Do Cucumbers Produce Gas & Aluminum?